A distinctive feature of mystical experience is that it is "imageless". Mystics of various traditions witness indeed to their going beyond all intermediaries so as to enjoy immediate union. Understandably, the idea of imageless immediacy is attractive, and it is especially in vogue with those who hope to discover that different (religious) spiritualities converge if only the particularity of, say, the Christian way would be left behind. However, a crucial question arises here. If mystical union consists in simply transcending what is part and parcel of the human condition, where is its relevance? Is the mystic as such in a position to be his or her human self - thinking and loving, enjoying and suffering? Can he or she be active in the world of humankind? Obviously, it is especially in the Christian tradition that this matter comes to the fore as a radical difficulty. For here there is the divine Image and Mediator, so much so that the Humanity of Jesus ought to be integral to a person's union with God. Perhaps the Christian mystic is such an extraordinary figure that the Humanity and all other images and intermediaries are, for him or her, at best a stepping-stone that is bound to disappear? 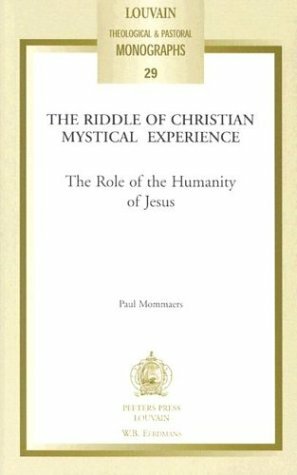 The Riddle of Christian Mystical Experience aims to clarify this issue by analyzing the writings of such visionaries as Julian of Norwich, Teresa of Avila and Maria Petyt; of the ecstasy-minded masters Richard of Saint Victor, Bernard of Clairvaux and Bonaventure (describing Francis of Assisi's experience); of the cream of the Flemish mystics, namely Hadewijch and Jan van Ruusbroec. Nevertheless, the preference for the mystical text does not prevent the Riddle from drawing on the insights of modern philosophers such as Jean-Paul Sartre and Jean-Luc Marion when treating of images and idols, or Michael Polanyi and Ludwig Wittgenstein when reflecting on intermediaries. The main result of this procedure may come as a surprise. Far from turning into a detached creature who forgets about the Humanity and the human, the full-fledged mystic is, as a Flemish mystic puts it, "wholly in God, where he rests in enjoyment, and wholly in himself, where he loves with works". Experiencing union "with intermediary and without intermediary", the true Christian mystic is "unimaged" as well as "imaged upon the humanity of our Lord through heartfelt affection"